Almost any type of floor covering has advantages over plain concrete. Epoxy garage floor coatings, however, come with more advantages than most. This type of flooring uses multiple layers of epoxy to create a perfectly sealed, incredibly durable surface on your garage floor. But how does epoxy flooring stack up against the alternatives? 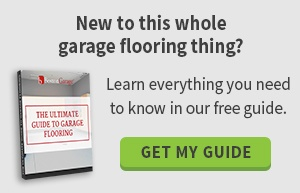 Let’s take a look at some of the other garage flooring options to see what makes epoxy flooring the smart choice. At first, plastic floor tiles sound like a great option. How hard could it be to simply lay down the tiles and snap them together? The problem is that if your garage floor has any spots that aren’t level – and most do – your floor tiles won’t lay properly, and they’ll be prone to cracking and breaking. It’s also very difficult to cut and shape plastic tiles in tight corners or around stairs and other obstacles. That’s on top of the fact that both weight and UV radiation will make plastic tiles brittle over time. Epoxy flooring doesn’t suffer from any of these problems. It works beautifully over uneven floors, and as the years go by, it won’t crack or fade as quickly as plastic tiles. 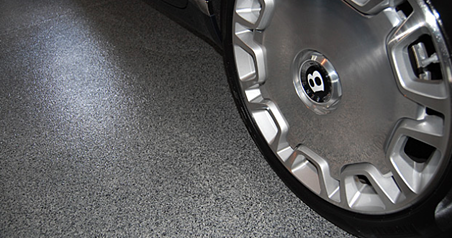 Rollout garage floor mats seem like the simplest solution. Much like an area rug, you can just roll them out to hide stained or cracked concrete. However, garage floor mats have a few serious disadvantages. It’s very easy to permanently stain them with oil, chemicals or even hot tires. They also don’t hold up well against scuffs, gouges and other damage. Something as simple as a stone in the treads of a tire can cause permanent scars. Worst of all, these mats can be dangerous in the winter. If you have snow or ice on your tires, the floor mat is likely to become very slippery. Professionally Installed or DIY Epoxy Floor Coatings? Most people eventually conclude that epoxy floor coatings are the best, most durable option. However, should you do the job yourself, or hire a professional? Professional installation is more expensive, but the advantages make it very worthwhile. Speedy Installation: DIY epoxy installation will take you between five and seven days to complete. Professional installers can have your new floor ready for foot traffic in 24 hours. Quality Products: Most epoxy flooring kits are made with diluted versions of the same product that a professional uses. This keeps costs down, but leaves you with an inferior finished product. Surface Preparation: Professional installers have all the tools and cleaning solutions needed to remove deep-set stains and fix damage to your concrete. Warranty: You won’t be protected by a warranty if something goes wrong with your DIY installation, now or in the future. Not only is a professionally installed epoxy floor less mess and hassle, but you’ll get excellent results. This is one instance where the benefits of hiring a professional definitely outweigh the costs! Epoxy floors come with many advantages. They’re stain and water resistant, skid-proof and very hard-wearing. If you’re looking for a flooring solution that combines good looks with long-lasting durability, professionally installed epoxy floor coatings are the only way to go. Schedule a free on-site consultation now to see how epoxy coating can improve your garage floor.